In the U.S, from November through April honeybees are active, though not wasps. A handful or honey bees floating around the structure as if inspecting, may be scout bees determining if the area would make a suitable home. You can watch the bees entering, honeybees returning with yellow pollen sacs on the back of their legs, indicate a beehive is inside - typically with thousands of bees. If there are no yellow pollen sacs on their legs, a hive may have just arrived, or they are just scouting the location. For scout bees, where bees are floating around, or have no yellow pollen sacs on their legs, to get rid of the honey consider grabbing a can of wasp or hornet spray and apply a single coat over the outer area in question. If after 15 minutes bee activity persists or worsens, there is most likely a beehive inside with thousands of bees. If however activity has ceased, then could have been a hit on the pocket book has been avoided. Feel free to bookmark this page encase you need to come back. To learn more about preventing a bees & wasps from moving in based on the location of the bee activity such as a chimney, roof, wall, visit the article on prevent a bee problem. Bees sleep from evening through early morning. If you are re-inspecting during these times and find no activity it could be that the bees are just inactive during this time period. Inspections are best made between 10am to 4pm. Rain, extreme wind, and very extreme heat can also keep bees from being active. For questions call our bee hotline. When it comes to a new swarm of bees, immediate attention is often much less frustrating, time consuming, and costly. Visit the following views if bees are in any of these areas: bees near window, bees in basement, chimney. Otherwise, with bees that have moved into a structure, getting rid of them from walls, roofs, eaves, is difficult to remedy. Occasionally, honey bees are found near vent or rain gutters. When a gutter actually goes into a wall or eave structure, bees may use the opening to enter and then build a hive in or around the wall, or under the roof of the structure. Typically there is 20 to 80 lbs. of honeycomb in a beehive. With honeybees, removing the honeycomb is important - pictures. Some time ago a caller called explaining that her pest control provider got rid of the bees, but now honey is running down the wall of her house. This happens quite a bit. When addressing a customer's bee problem, asking some basic questions can help find out what they already know and what may help to explain. One question is ‘have you ever had bees before?’ To this she responded “ Yes, he exterminated a hive of bees before in a different spot a year ago” (that can also be a common response). The homeowner was not informed to remove the honeycomb, or it was not brought to her attention. Many times homeowners leave the honey and comb in the wall or attic because an exterminator didn’t provide the option to remove the hive and honeycomb. Leaving a beehive and honey in the structure is asking for ongoing problems in the future. It’s kind of like a mechanic changing your oil and then saying “here’s your car back… oh by the way you’re going to need a new oil filter, I threw your old one out.” Obviously we wouldn’t just drive off without an oil filter because we know better. But if you didn't know much about changing oil, you might say – ok, thanks for your help, and drive off. A beehive of about 3 months may have 20 to 40 pounds of honeycomb. During daytime bees keep the hive cool using their wings to circulate air through it. On a hot day in Arizona, Texas, Florida, Las Vegas, or California, when bees have been killed or extracted, and the honeycombs not removed, that honey can start melting very quickly. 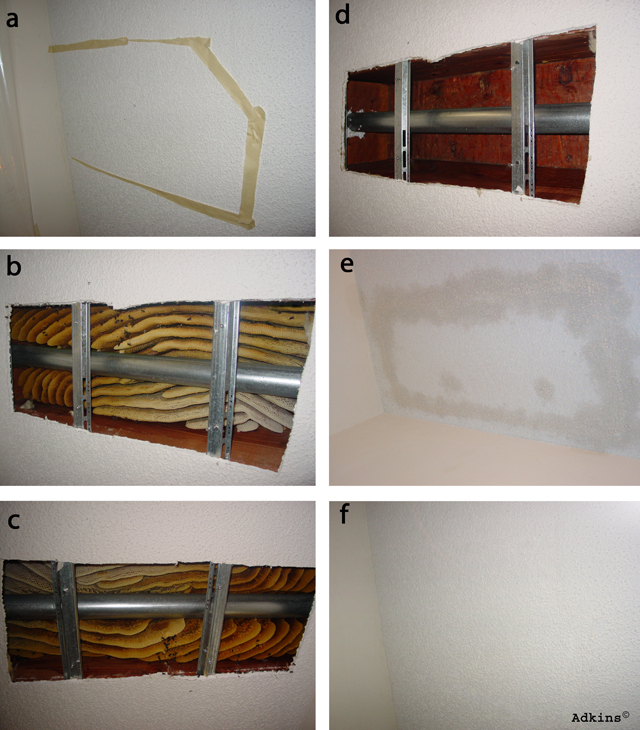 Honey will melt down the wall or roof line, permanently setting into the structure. This often can cause staining or mildew and long term bee problems as well as attract rodents, moths and other insects, and other critters. If you’re wondering why you keep getting bees, that would the greatest cause. With recurring problems, it is simply best to remove and clean out the known hives that exist and do some extra work suppressing the smell of existing hives and optionally bee proof some potential problem areas like vents, roof line, wall, eaves to keep bees from returning. View testimonials of what others have said. Areas of the structure the sun rises on are more likely to get bees. By getting rid of your honeybees and not removing the honey, a pest company can create even more problems without you knowing it! Exterminators often tell home owners that the chemical powder they use to kill bees will dry up the melting honey and solving your problem. Regrettably, a pest product designed to kill and keep bugs away does not hardly dry up 10 to 80 lbs. of honeycomb. However, it sounds much better than spending more money toward the problem. Other pest companies provide you with a slip of paper releasing themselves from liability and recommending to find someone to remove the exterminated hive and repair the structure. Finding a contractor (with no bee removal experience) to open, remove, and repair a wall or roof, usually incurs high costs with no warrantee on returning bees. Here is a short list of reasons why you may not want to use a bee exterminator to kill bees. Learn about prices and cost of bee removal as well as discounted and free bee options. If you have a question you can Ask the Beeman, Call the hotline, or Request a Callback anytime. I have what I think are baby bees in my laundry room, I saw 5 today! Are they getting in through the dryer vent? Is this a bigger problem than I think? live in Indianapolis, IN. 46219. Best to send me a email for contact. Hello, I'm not sure what I have-bumble bees, carpenter bees or neither of those. I hear noise early morning or later at night. I don't see many bees flying around any particular area to see where they are or are not going in. I sprayed and have tried to cover the area I thought they were going in, but I'm still hearing them. Could you help me diagnosis what I have and need to do? Established bees in the wall will normally dig out when sealed in. Sometimes they dig the wrong way and end up in the house! (though they may typically not be to aggressive at that state in the house)e.
Your message was fwd to James, he can be of more assistance. You can reach him through the site 800 number. PS a cellphone or email picture could help him if you prefer info over the phone. Front of our home, looks like they are entering holes in rock around window casing where foundation shift caused a hole to develop. We sprayed outside of wall with wasp spray, in hopes that these bees were scouting. We are continuing to do that. I believe I have a honey bee infestation in the front of my house. The honey bees are going in and out of what I think to be a weep hole under my living room window. I noticed 1 or 2 flying in and out last year but never saw anymore. I had called an exterminator to help identify the bee and he agreed it was a honey bee and said there was nothing they could do to help. After reading your website, I see they usually come out between the hours of 10 and 4 and we are not typically home then. That is probably why I have not seen more of them. My sister called me today and said there were several going in and out of the same hole as last year. I am not sure what to do at the point. I need to find out how to locate their hive within my wall and how to get rid of them. I know you give free estimates, what would be an estimated cost of this kind of removal? Do you remove the honeycombs as well and clean up so no other bees or beetles will move in, in the future? Sounds like your on the right track. There are likely 5,000 to 11,000 or many more bees living in that wall or roof area. Yes removing and cleaning the area, as well as repair and bee proofing are important to solving the problem and from getting more bees in or near the roof or wall in the future. For honeybees that is typically the only way to solve the problem. It takes a little more work than if the hive were just on the outside of the wall. Looks like Jeff is closest to you, he would be able to help you. If you call the 800 number it should connect you to him. Hello, I have been experiencing a few bees hanging around my trash can outside that we use to hold empty soda cans. We have a pile of wood next to this trash can also. Trash can has been in use for at least two yrs but the bees have only been present the past two weeks. We live on phx az. Is it the trash can that it attracting the bees? My husband found a bee looks to be honeybees in our outside wall by the roof it is next to our childrens window on the second story i was up stairs and found 2 bees killed them and found 3 more killed them and there were more after that and keep coming back .What should i do? Good question, in the case of honey bees it is usually very important to remove the hive in the wall to get rid of the bees. Base on your location it is more common to experiance Hornets or Yellow jackets in fall season, though they may be honeybees (See bee identification chart). Typically it is best to have someone with experience remove them. If you are outside of the city, feel free to reply back and include a picture or two as well as your phone number. I see lots of bees in the corner of the house. I suspect that there must be lots of honey inside the attic. Beekeeper: Sally It's very possible that you do have honey in the attic, but if the bees are alive, the honey will be suspended in the honeycomb. If possible, follow this link to our Houston bee removal office and give them a call to come see what's going on. Hello, I've bookmarked your site, it's very interesting and informative! 2 weeks ago several bees spent several hours inspecting a small gap under our shed, by the door. Later that day a swarm moved in; towards evening an exterminator got rid of them. We've had the shed for several years and its never attracted bees before. Yesterday, a dozen or so scouts showed up at the shed again, but they were inspecting and entering other areas along the foundation, not the original location. They eventually left but before it got dark I piled up dirt to cover the gaps (see picture). Today I've seen a few bees in the area but they quickly lose interest and fly off. My question is, is this enough to dissuade them until we can properly seal up the gaps with caulk later this summer? Do honeybees dig through dirt to get at potential nest sites still in their memory? Thanks, and great website! Beekeeper: Hi there, Jutta thanks for the compliment on our website :) and for uploading a picture. If what you are saying is correct, and the bees swarmed to the shed and then the extermination happened in the same day, the bees shouldn't have had time to establish any honeycomb. Sheds can be difficult to beeproof, especially if there is an existing hive underneath the shed; however, right now is still swarming season, so it's not unusual to see scout bees investigating the shed again (they probably belong to a separate hive that is ready to swarm). It is assumed that if there is no honeycomb, and the bees are scouting, then you can successfully close off the entrance to the bees' desired home and the scouts will look elsewhere. Typically bees will only resort to digging if they are trapped inside. More likely, a rodent would dig through and the bees would then exploit that opening. In this case personally i would not worry about caulk or much else. Yes bees can dig through dirt, wood, stucco, etc. My recommendation is to take your chances with what you've done. If the bees move into the shed, feel free to contact our Tucson bee removal branch. Good luck! i am desperate for help. for about 3 days my husband and i kept asking one another "what toy is that" , we don't have any bee toys for our toddler or baby. yet we continually hear a buzzing that will stop and then come back at first was not very audible, then very loud. it goes on all day, stops at night time, or dark. we cannot find a wasp nest, bees, or anything, but we have seen wasps around, just had out overgrown yard mowed right before all of this began...so we just want to get rid of them we are scared and not sure where to start. we do have an attic by the way. Beekeeper: Hi Stacy, It sounds like you have a bee hive in your wall, vent or attic. Sometimes this is difficult to locate. It can be very difficult to get rid bees yourself, I recommend having a bee specialist come out to locate the bees buzzing in the wall. Here is our contact in Orlando Florida For people in other areas in the US or Canada visit the bee removal homepage. Will it help if I "bomb" the attic,with the available insecticides sold at LOWE'S? Beekeeper: Hi patty, generally this makes matters worse. :) But getting ride of bees and removing the honey can be expensive when your bees are in the wall, roof, or eaves. Additionally I don't know anyone that budgets for bees! In such cases we like to look into options of breaking up payments, discounting or trade. Hi. we just noticed today about a dozen or so small bees (black?) buzzing around our front porch and a few entering into a tiny crack that is part of our upstairs balcony. Should we do anything about it or just let them bee?? Beekeeper: Barbara, Hi thanx for visiting, Ive moved your post here, likewise there is some additional info on this page for you. Are the windows close to the fire place? If so (between hours of 10 to 4) look near chimneytop. Otherwise look around the eave area were the roof meets the wall. Lastly but less likely and more evasively - sometimes the bees use a vent on the rooftop as an entrance point. Hope this works for finding the bees - next step getting rid of them. Good luck. ok info helpful... in order to get rid of this problem am i forced to take the wall down??? Beekeeper: Joe, sometimes it feels like that. Call if you need more info. Glad to know that the powder sub. won't solve the problem. I have honey bees in my daughters bedroom wall. not sure if or how long they been there. I got to feeling around the window pane and pushed a whole in the wall. When this happened alot of bees came out! Called pest control and they explained what needed to be done- but never mentioned anything about a honey comb. Thanks so much, Now I need to find a bee keeper. Beekeeper: I've experienced similar situations and spoken with home owners that had wet spots in their ceiling above were the bees were. It turned out, in almost all of these cases to be a large yellow jacket nest. Although I don't know if this is the case with you, I appreciate your leaving the first comment on my feedback article. I hope to have Adkins Bee Removal throughout all the major cities in the US by 2009.